The Washington State tax system hasn’t been updated since the 1930s, and a 2018 EOI report found Washington State’s tax system to be one of the most regressive in the country. When the wealthy pay such a uniquely low tax rate, the state budget suffers as a whole and funding falls short for necessary public programs. EOI, the Transit Riders Union, and the Trump-Proof Seattle coalition led voters to approve city-wide income tax on individual incomes in excess of $250,000, and EOI is now leading in the legal proceedings to overturn an outdated ruling currently preventing the tax. Seattle’s passage of a progressive income tax will serve as an example to Washington State, and will encourage reform of an outdated and imbalanced tax system. 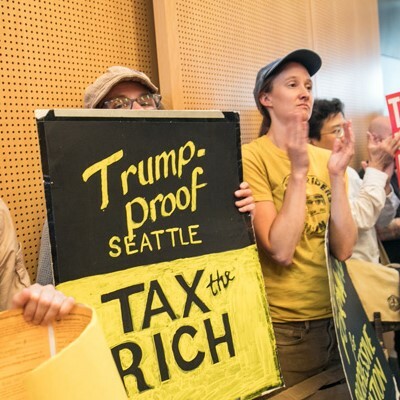 When the Seattle City Council passed an income tax on the very wealthy in 2017, it was the first progressive income tax in Washington in 80 years. EOI achieved this with the help of the Trump Proof Seattle Coalition, a consortium of community, labor, environmental, and social justice organizations. Tax my income and fix my city. Please. I’m an engineer at one of our local tech companies, and I’m fortunate enough to qualify for the proposed income tax on Seattle’s affluent. Unlike Steve Ballmer, who made headlines commenting on the proposal, I look forward to paying my fair share to keep Seattle wonderful. My grandfather first came to Seattle to escape Russian pogroms and build a better life in the New World. Even though my family had little, the opportunity in America allowed my grandfather to send my dad to a good public school, and my dad in turn went on to teach at Harvard Medical School. I’d like to think my grandfather would have the same good fortune if he arrived today. But the opportunity afforded my grandfather is no longer attainable. We call Seattle a sanctuary city, but the services that we and our immigrants depend on are underfunded and under threat. Our public schools are criminally underfunded. Rent is skyrocketing, pushing middle-class and poor families out of their homes. Tents line our bumper-to-bumper highways.